Jesus touched the eyes of the blind man, and they were made well. Then Jesus told him to return to his home alone, and tell no one about the miracle. EAR BETHSAIDA, A town by the side of the Sea, lived a man who was blind. 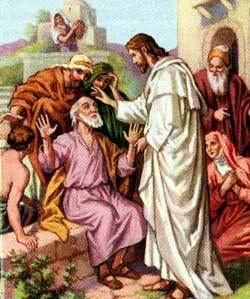 He had never been to Jesus, but he had heard how the eyes of blind people were opened by this wonderful man of Galilee, and he too wished to be healed. One day he heard that Jesus and twelve other men had come to Bethsaida. Then his friends led him to the place where the visitors from Galilee were stopping. Jesus did not wish to attract multitudes to himself any longer. Now he wished to have time to be alone with his disciples. So he would not heal the blind man in the place where they brought him, but took the man by the hand and led him out of town. Alone with him, he placed his hands upon the blind eyes, then asked whether the man could see. At first the man could not see clearly. He answered, "I see men walking about, but they look like trees walking." Jesus touched his eyes again, and they were made well. Then Jesus told him to return to his home alone, and tell no one about the miracle. He did not want a crowd to gather round, for he could not stay in Bethsaida to teach them. From this place Jesus and his disciples journeyed north, to a city called Caesarea Philippi, not far from Mount Hermon. On their way Jesus asked the disciples some questions. First he asked, "Who do men say that I am?" The disciples answered, "Some say you are Elijah, the prophet, come back to earth; some think you are John the Baptist risen from the dead; others believe you are Jeremiah, the old prophet, or another of the old prophets who used to teach their fathers long ago." Then Jesus asked, "But who do you men believe that I am?" And Simon Peter answered boldly, "We believe that you are Christ, the promised Messiah and King, and the Son of the living God." Jesus told Simon Peter that God the Father had caused him to believe this, for of a truth he was the Son of the living God. But he asked the disciples to tell no one that he was the Christ, for the time had not yet come for this truth to be publicly known. From this time Jesus began to talk to the disciples about the sorrows that would come upon them at Jerusalem when he should be taken from them and put to death by enemies among their own people. The disciples could not understand these words, for they believed Jesus would soon be their king and that they should rise to prominent places in his kingdom. They were displeased to hear him speak about dying, and rising on the third day. Simon Peter, who often spoke for all the twelve, took Jesus aside and said, "These terrible things will never happen to you!" But Jesus looked sadly upon his disciples and answered, "You speak as Satan, the tempter; for your words are pleasing to man but not pleasing to God." How much easier it would have been for Jesus to accept a throne and earthly kingdom than to suffer and die! But never would he yield to Satan's wishes, though he must suffer the greatest agony. But Peter and the other disciples could not understand. Afterwards Jesus called other people to him, and when they had come he began to teach them what it would mean to be one of his followers. He said, "If any one follows me, he must not try to please himself. He must be willing to bear his cross. And he must not try to save his own life; for he who saves his life shall lose it, but he who loses his life for my sake shall find it. And what is a man profited even if he should gain thee whole world and lose his own soul? And what will a man give in exchange for his soul?" These questions caused the people to wonder at his teachings. Then Jesus said, "The Son of man shall come in the glory of his Father, with his angels; and then he shall reward every man according to his works."